I almost started this with an apology for being absent from the blogosphere or whatever they call it for more than 3 weeks, but who am I kidding. Hi, Mom. I’m writing again. You should probably sit down for what I’m going to say next…. Paula Deen may have diabetes. How are you feeling? Can I get you some water? I know this is shocking, and tough to take. Oh, you’re not surprised? This turn of events for The Lady MIGHT be related to her Brunch Burger, and while I’m not sure eating that is a great decision (but I’m so CURIOUS), but I’m a fan of anyone who promotes cooking over eating on the run. It’s the only way to control – for better or worse – what you feed your face. I have to support her on her use of actual food. Butter = food. Cream = food. Cheese = food. Krispy Kremes, maybe not… But really? Don’t pig out on it and you won’t get diabetes. Lately, I’ve been smelling things in the break room like gas station panini heated up in the microwave, Taco Bell quesadillas, and other things that I classify as Not Quite Food. Any sandwich that was made long enough ago to have a sealed wrapper on it is not for me, and I don’t think I need to explain why Taco Bell is in this category. So why do I want to EAT THESE THINGS?? 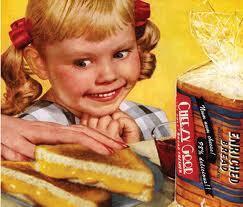 I love cheese, but I love it more when it’s melty. Fat free cheese is NOT food, and the 2% stuff only makes it into my fridge when my pants are too tight and I’m going to blend it with actual cheese. 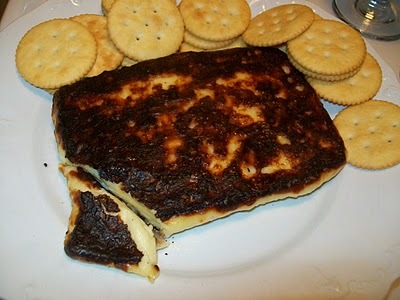 You can melt cheese on nachos, on chili, in a grilled cheese, or just in a frying pan! This is a genius Scandinavian cheese that you grill on both sides, and then spread on crackers, courtesy of Michigan Cottage Cook. Sometimes they sample it at the fancy grocery store here, and I recommend you shop on that day. Don’t want such a melty hunk of cheese in your skillet? Just sprinkle a little shredded cheese in there! Joyful Abode likes to bake hers(and fancy them up a little bit! ), but you can do them in a pan, too. And look how tasty! On a salad or just by themselves! And I can’t really find the words for the ingenuity at the Smitten Kitchen. 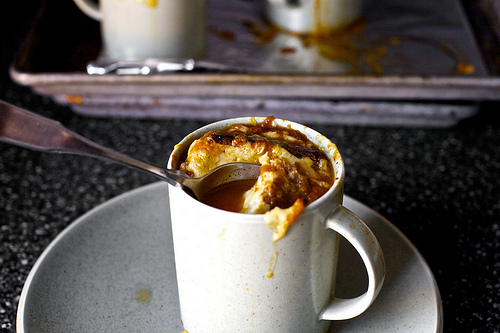 She made tomato soup without opening a can and topped it with grilled cheese hats and baked it in the oven in a MUG! Want some cold cheese? How about brie on a baguette with prosciutto and blackberry preserves? Or thick shavings or parmesan on a salad? Or string cheese! Eat real food, the fat kind and the vegetable kind. Maybe don’t eat a burger on a Krispy Kreme bun – maybe get that one for the table so everyone can try a bite. Don’t eat 3 pounds of dairy fat each day. Don’t get diabetes or heart disease. Go in peace. Hi, Dear; I’m so happy to see that you’re writing again. I do feel compelled to point out, though, that “but” in the final clause of the fifth sentence of your fourth paragraph is out of place since that clause should be independent (following, as it does, the dependent clause introduced by “and while”). Thanks, Mom. I think I’ll leave it the way it is. I’m writing for the masses, whether or not they’re reading – perfect grammar is off-putting. Also, I didn’t take the pictures. 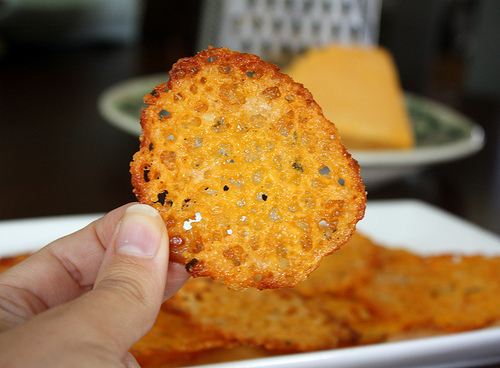 I should probably make some cheese crisps soon. You know, to round things out and serve to balance the huge hunks of cream cheese I’m eating nearly daily. You seem to have forgotten the brilliant greek cheese invention _saganaki_, which combines fried cheese with other perennial fan favorites “alcohol” and “shouting”. OPA!